Anca Cristofovici, Stela, Ninebark Press, 2015. Years after her mother's disappearance from an unnamed city in an unnamed country governed by a repressive regime, a young dancer, Cora, struggles to untangle the knot of half-truths and informational gaps surrounding the official story. 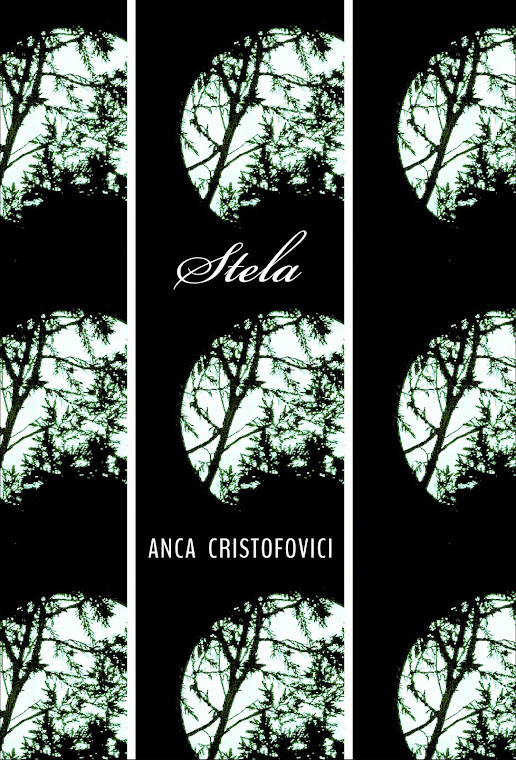 Thoughtful, inventive, and beautifully lyric, Anca Cristofovici's novel Stela masterfully challenges the obfuscations of state terror and its long rolls of the disappeared with the liberating and illuminating transformations of dreams and art. Author Anca Cristofovici is hard to typecast, and if there is any easy path for a writer living between cultures, it isn’t the one she has chosen. Born in Romania, where she published at an early age, she defected in 1985 and has since lived in France and, temporarily, in the United States. While pursuing an academic career, Cristofovici has continued to write fiction and reconstruct herself as a writer in two non-native languages. A reflection of her multicultural experience, her publications in Europe and in the United States include essays, fiction, poetry, and translations, written in English, French, and Romanian. She has also contributed to exhibition catalogues and international artists’ projects. Cristofovici has been invited to read at venues in the Unites States and Europe. Among her honors are fellowships from the British Academy, the Rockefeller Foundation, and the Terra Foundation for American Art. This interview was conducted Berlin-Paris by e-mail. Ellen Hinsey: One aspect of the political upheavals and traumas of the 20th century is that one cannot take one’s native language for granted. How has living in different cultures and writing in three languages affected your perspective as a writer? Anca Cristofovici: Brutal circumstances affect anyone’s perspective. In radical forms of relocation, one becomes no one. With some luck, that can turn into a fantastic formative experience, should one be ready to embrace it. Both my native environment, Romania, where I started as a writer in the mid-seventies, and then the places I lived in following my defection in 1985—England (briefly), France, and, the United States (where I studied and worked for some years)—involved finding a space in which to function as a writer, against all odds. Probably, had those things not happened, I would have become another kind of writer. But they did happen: whether it was the relocations, the psychic and physiologic reactions they engendered, or the material conditions that provided (or didn’t) time and space for writing. I’ve never experienced much anxiety of the blank page. I’m five books behind. When I’ve finished one, I don’t have to worry about what’s next! I published quite early in Romania—short fiction, poetry and plays (I remember the title of one of these long-lost plays: “Columbus, Does America Exist?”!). Early on, too, I realized I wasn’t equipped to work against censorship or other political hindrances creatively, so I preferred not to. Living with only an intermittent public writer persona for a long time has been, I must say, rather beneficial to the creative process, despite bouts of exasperation for being cast in the wrong life and seeking to “outcast” myself. At times this complex trajectory is responsible for my feeling that I need to justify myself as a writer. But I have come to terms with being a clandestine traveler on a night train on some enigmatic venture, which is mine all the same. In terms of cultural attachment, I’m close to the Mitteleuropa cosmopolitan tradition and think of myself as a European writer. Yet, as American cultural history has been my passion and profession for many decades now, I also feel somehow “transatlantic,” with an interest in how cultures coalesce in both traditions. My new novel, The Long Way to Vienna, explores that paradox. Anyway, as long as I can write, it’s alright, even if, strangely enough, a writer who is independent of national affiliations (or any other affiliations, for that matter) doesn’t fare easily in these global times. AC: Well, the novel starts with the story of the loss of a mother and her teenaged daughter’s attempts to come to terms with it. She has missed the funeral, which amplifies the confusion accompanying any process of mourning. In addition, this happens in a context of dubious disappearances and a politics of fear conceived as an instrument of control. Because of this particular context, Cora distrusts what she had been told: that her mother died in a car accident. Her growth into adulthood is inseparable from this enigma she must solve; in this she is partly helped by Luca, a painter and neighbor, with whom she will later cross paths outside the “perimeter of fear.” The narrative blurs distinctions between fact and fantasy, focusing on the narrator’s perceptions. And although there are no explicit references to place, for both the initial setting and for Cora’s and Luca’s subsequent peregrinations, a number of details suggest what part of Europe they are in. A degree of abstraction from any specific setting seemed necessary in order go to the crux of the matter and grasp patterns, see which parts of totalitarian structures are contextual and which are inherent to human nature. “Systematic and chaotic” emerged as a significant pairing around which the novel revolves. It designates the paradoxical coupling of inflexible rules with random and ludicrous practices. In the course of writing, it appeared to me that this fundamental contradiction in terms—an extravagant one, at that, with regard to human and cultural loss—is responsible for the difficulty in understanding (and accounting for) how communism works. The questions that occupy the characters’ minds evolve into other, more oblique ones: what is the legacy of so much moral and spiritual destruction? How do one’s broken memories intersect with those of others to make sense of what happened? Where can one go with one’s life from there? And how? The difficulty of such a subject is to find the right tone without verging on victimization or sentimentalism. The book took a long time to write, time to find a perspective not overtly political, folkloric or anecdotic, which are the common ways of looking at Eastern Europe, a geographical and political categorization for an area which is, in fact, at the intersection of very different cultures, religions, and languages. AC: In the late 1990s, when I started writing the novel, testimonies published in Romania after 1989 came to my attention, as well as oral histories and compelling documentary films on the deportation of Romanian populations to Siberia and to camps within Romania in the Baragan area, or on detention in what is thought to have been one of the toughest Eastern Bloc prison systems. That material, with no circulation in an international context, slowly made its way into the novel along with documents from other East European countries, but not only. Once the applause following the fall of the Iron Curtain passed, it seemed necessary to connect those events to current concerns about the dangers threatening democracies everywhere. Few critiques of what has become of societies previously behind the Wall are based on serious analyses of communism’s inner mechanisms and its impact on the most intimate relations of family, language and memory. Yet, using such material involves an overwhelming responsibility, because you don’t want to (mis)appropriate people’s lives. My deep-rooted aversion to realism prompted me to de-familiarize those experiences, and to attempt to find a conceptual framework that would counterbalance the documentary component. Initially, the fact that the narrator is a dancer and Luca, a visual artist, came from persistent images carrying narrative potential. It turned out that the forms of art they practice reverse the pair “systematic and chaotic”: from random events emerge creative patterns of human experience (what Luca calls “provisional arrangements”) instead of restrictive frames. Readers familiar with Merce Cunningham’s technique will find much of Cora’s bodywork and relation to dance is based on this method, which derives, primarily, from how he looks at all forms of life (I am also reminded here of Merce’s drawings of animals). AC: Yes, people who return from captivity are rather sketchy, aren’t they? Physically, I mean. We have seen pictures of them, yet not many from those in Eastern labor camps, psychiatric hospitals, or just of people whose energy has been drained by everyday life’s complicated gestures. They are spectral, to the others, to themselves. In French, les revenants is a term that is used for ghosts, but also for those returning from camps. However, bringing those characters into visibility beyond the stereotypes of Eastern Europe that circulate in Western visual culture seemed crucial, and I tried to place them on an orbit that goes from darkness to gradations of light (and lightness). Truly, I see the characters of the novel more as forms and substances, misty figures as in, say, some of Bill Viola’s video pieces, “The Veiling” or “Three Women,” works that sustained the energy of the book as I was writing it. Minimal detail for maximal effect, at least that was my intent. I recently heard about a “writer’s tip” that I unknowingly used in the most literal way: “Every character should want something, even if it’s only a glass of water.” Just after Luca has passed the border with the intention to defect, his first words are: “Ein Glas Wasser, bitte.” At times a drink of water counts a lot. To highlight such details places them into another dimension: magnified, they turn into a vital necessity. AC: Actually, I’ve spoken about “surreal” aspects with specific reference to perceptions of everyday life in the 1980s. I wouldn’t, however, use that term as a general reference to totalitarianism, in Romania or elsewhere, since its faces are so diverse. In everything I’ve read, the experiences of people in life-threatening situations struck me as experiments in staying alive. The narrative form of the novel, then, is only an adaptation to the characters’ shattered life course, the imaginative and emotional solutions they come up with. All of them somehow break the unnatural order stifling their lives, crack the system: Stela, in losing her life, Cora and Luca, in transforming theirs, and, in the process, Stela’s. The fragmentary nature of the narrative doesn’t preclude a sense of suspense if the reader embraces the narrator’s hesitations and accepts the fact that finding out the truth in the given circumstances is, simply, impossible. Was the accident provoked? Was Stela abducted? Did she defect? That spectrum of possibilities concerning Stela’s disappearance allowed me to condense the material we just referred to. AC: Among the fictional frameworks that hold both documentary fact and fantasies, my choice went naturally for stylization and poetic perspective. It seemed to me that such heavy-duty historical and psychological material might be more effectively channeled into a more evocative (even if allusive) narrative. In the media, the changes in the world over the past twenty-five years have appeared mostly in scripts of high-pitched rhetoric of suffering and violence. The emotional patterns of the Cold War were subdued, violence imploded, words mimed rather than voiced, gestures amplified, much like in a silent movie. Such patterns create a serial effect, even as the narrative and the images that carry it tend to break them into verbal form, so that selves who were meant to become uniform elements in an unending series surge into significant shapes. AC: Certain works gave me a base: those of Claude Simon, in particular, or Joseph Brodsky, for their firm nonalignment, their rigor, and for their fine irony tinged with tenderness, or the work of Elizabeth Bishop—a master in the art of traveling light. Much like the documentary material, echoes of these writers have made their way into the novel, wittingly or not, along with other reminiscences. Here and there, I incorporated short excerpts. I hesitated to provide a list of these appropriations, since they seemed to be poetically more effective under cover, so to say. Still, I found a way to weave into the book’s fabric an allusion to the source of fragments I used deliberately. Documentary or artistic material is part of experience, of another kind, already formalized: what we have read and seen and heard is part of who we are, isn’t it? And so is it part of the characters’ verbal texture. EH: Who are the other writers you feel close to? AC: Oh! That list is long! Above all, I’m interested in how an artist puts an obstacle to good use (also, in how one can fail to). I relate to writers who are quite different in form and sensibility—and different from my own approach to writing. I also have strong affinities to the visual arts because of the enhanced perceptions they solicit, which open up extraordinary spaces in the mind: artists such as Thierry Küntzel, Geneviève Cadieux, or Stan Douglas, who deserve to be better known and whose work I have touched upon in my book Touching Surfaces. For what it means to them to be writers, I feel close to Dawn Raffel or Christine Schutt. Diane Williams once told me to give myself permission, as a writer. It’s about the best advice I’ve ever had: whenever I try a dangerous trapeze move, her words are my safety net. Further back in time, I spent some years on John Hawkes’ fiction, writing a dissertation, then completing a small book (The Child and the Cannibal). His work came to my attention when I was young; I fumbled in the dark at every page, but couldn’t resist the beauty of the flashes I found there, and it occurred to my innocent self that, if I somehow managed to make my way into that tunnel, I’d see the light some day! In 1962, Flannery O’Connor wrote a wonderful blurb for The Lime Twig: “You suffer it like a dream. It seems to be something that’s happening to you. . . . This . . . I might have been dreaming myself.” Looking closely into such a work, living with its sound imprint for so long requires a lot of discipline to distance oneself from it. Writing on photography provided an alternative that involved observing rhythmic patterns other than verbal ones and liberated space for my own cadences. And when I forget all I’ve learned from Hawkes, I’ll always remember “coherence of vision.” He was an extraordinary teacher who knew how to bring to light each young writer’s own gifts. I sometimes wonder what would have happened if, instead of writing my dissertation, I had gone to Brown. But, at the time, that was a technical impossibility. However, I met him and his wife, Sophie, in Paris and in Providence, Rhode Island. We corresponded and did an interview on his mythic horse, Whistlejacket, and his thoughts on the creative process, which was published in Italy. Two weeks after he passed away, there was an envelope in my mailbox with two letters from him. Few people would send that kind of letter! EH: Did you ever tell him that you wrote fiction? AC: No! Anyway, writing was bracketed at the time. But a nice compliment for Stela came from a writer who studied with him: “Jack would have loved this!” Who can tell? Maybe the horse! EH: As we’ve just evoked, the visual arts play an important role in your novel. They appear in a number of forms: dance, film, video art, painting. What is their significance to a subject that is deeply steeped in a history of physical, moral, cultural destruction? What is the meaning of dance, in particular? AC: Art has been a natural and vital presence in my life. I have known artists struggling to keep at bay the pressure of power on their art. Some lost their lives because they dared to speak out. Others remained hostages to silence. Some of those who escaped have been muted in other ways in their new precarious lives beyond the Wall. I am also interested in individual stories of survival precisely concerning how they resonate with creativity—one needs perseverance, luck, and imagination to carry on under dire circumstances. Stela revolves around two artists’ destinies and loss turning into a creative force. Art making is central to the plot. The reels (rolls of surveillance film shot by the secret police) are used by Luca as found-footage for a video portrait of Stela. Dance combines rigor with grace; the ephemeral quality of movement bears intimately on loss. Narratively, dance draws events into patterns rather than arranging them in a linear fashion. It focuses on the body as a site of psychic work. Frank Bidart wrote a long poem, “The War of Vaslav Nijinski,” where, as madness was seizing him, Nijinski tried to choreograph a dance about the Great War “which gives us//pattern, process//with the flesh//still stuck to it.” And there are those stories of dancers from Eastern Europe escaping to the West. Dance lifts weight from the subject of the book. In the end, lightness prevails. Stela’s luminous figure, recreated by Cora’s and Luca’s reminiscences and their art, counterbalances the legacy of darkness (and that of three generations of women facing it). The working title of the novel was Kidnapping—one of Cora’s hypotheses regarding her mother’s disappearance and an allusion to Milan Kundera’s essay “A Kidnapped West.” Towards the end, however, the main character’s name turned out to be a better option: Stela, with that one “l” missing, as it’s spelled in some languages. That particular spelling of the name also evokes the common noun, with its cluster of associations: commemorative inscriptions; a tablet on which the first epics were written; and, of course, the Latin for ‘star’ (as in ‘celestial body,’ and ‘fate’). EH: We began this interview talking about language and displacement. Why did you choose to write your novel in English, and not in French or Romanian? AC: That is a long story and part of the subject of a volume of essays on which I am currently working. The short version is that if I want to know the temperature in Bucharest, I get it from CNN or the BBC. For French television, the map of Europe stops in Vienna. There are other reasons—cultural rather than meteorological—but they are too complex to go into here. Linguistically, French is too close to Romanian; in terms of fiction, my affinities are with the more flexible, formally imaginative American tradition—such an eye-opener in my formative years. I started reading in English as a teenager, then studied English at the Faculty of Philology at the University of Bucharest with some people who managed to save us from brainwashing and lent us books (many of them the only copy in the country, feverishly passed from hand to hand). I owe a lot to their devotion and recall, in particular, my first contact with Wallace Stevens’ poems. The professor typed them in sets of five (the typewriter would fit up to four carbon sheets). Since there were more than that of us in the class, he typed them again. Whenever I read or teach “The Man with A Blue Guitar,” I can’t dissociate the poem from the blurred indigo letter type of the carbon copy. And then, I always feel at home in an uncanny way as soon as I set foot on American soil, which has to do with language, space, people. On my recent reading tour, for example, I was surprised to meet categories of readers that I hadn’t imagined would take an interest in such an unconventional novel. I am grateful for their generosity and that of my publishers who put their trust in my work. For the writer crisscrossing cultures, there is also the question of what kind of community you belong to in terms of the circulation of your work. All my books were published by independent presses (literary or academic) and I’m happy to be part of that counter-current in book culture. Belin, a scholarly publishing house that brought out my essays on Hawkes, has had a discrete but persistent presence in France since 1770. May it be the same for independent publishers who courageously promote innovative writing and book forms these days! Recently, I’ve co-edited a volume on artists’ books, The Art of Collaboration, brought out by Cuneiform Press, with wonderful American and European contributions which speak to that effect. EH: In terms of your writing process, how do you feel about writing fiction versus non-fiction? AC: Well, in both cases it’s writing—and lots of work! Only how one understands them sometimes differs, but, at heart, there’s no separation between my sensibility as a writer of fiction or essays. In both I engage with experiences of varied natures (geographic, cultural, of artistic media), look at how cultures cross, idioms transform, and how, eventually, their reverberations enhance life. To me, non-fiction, the probing into the metaphoric potential of theoretical or conceptual notions, has to be creative. It’s a perspective on life. D. W. Winnicott evokes this in his essay, “How to Live Creatively.” Conversely, fiction too involves research. Few readers imagine how many pages it’s necessary to read just to make sure you’ve got the workings of a machine, a dress-cut or who knows what other detail right. And if it isn’t right, you can be sure that the bug in your novelistic device will give you sleepless nights. Non-fiction, too, can prevent you from sleeping. From photography I’ve learned the importance of precision and that there’s no such thing as a photograph in isolation. That’s not far from how, for me, images inform a novel and add up into a story. Even as I find working with “negative capability” compelling, a number of details have to be exact or the picture won’t develop. In the end, fiction writing is much like camera work: a matter of technique and how you look at people, objects, environments. Questions raised in my essays resonate with my concerns on how the imagination functions. It has happened that a point in an essay will strike me years later as close to some detail in my fiction, or even specific phrasing will unconsciously migrate from one form to another. Dictionary entries or exhibition catalogues require extensive research and a capacity to synthesize and grasp the smaller and the larger picture, which also relate to how I process material for fiction. EH: Let’s conclude with a final question regarding language—are you contemplating translating your novel, Stela, into French, or, for that matter, into Romanian? AC: Absolutely not! I am a pretty faithful translator of other writers’ work, but I’d make my novel into another book entirely because of how I relate to each language—and I couldn’t have written the novel, as it is, other than in English. That said, I am translating a book of short fiction that I wrote in French about ten years ago. It has turned out to be an interesting process: how the English version makes me reconsider the original, triggering, at times, new turns in French. For some arcane reason, I am attached to these vignettes, which I never sent out for publication; I am currently collaborating with the American artist Marsha McDonald to bring them out in a bilingual artist’s book. Marsha created the photographic composition for my novel’s cover and provided a wonderful video piece for the book’s trailer. Working with her is like having someone who sees what’s in- between the lines and turns those blanks into visual language.